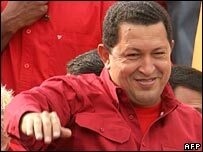 Mr Chavez has described President Bush as a "terrorist"
The US is imposing a ban on arms sales to Venezuela. The US state department said the decision was taken because of what it said was Venezuela's lack of support for counter-terrorism efforts. Venezuelan President Hugo Chavez said the ban "doesn't matter to us at all", saying it confirmed that Washington wanted to trample on smaller countries. The left-wing Mr Chavez, who is currently on a tour of London, has described his US counterpart George W Bush as a "terrorist", denouncing Washington's Middle East policies. Venezuela is an important source of crude oil for the US, but the relationship between the two countries has been deteriorating for some time. The state department has repeatedly expressed its concern over Venezuela's contacts with Iran and Cuba and also over its relations with armed groups operating in Colombia which the US considers terrorist organisations. [The US is] the empire and it has a great capacity to do harm to the countries of the world. US state department spokeswoman Darla Jordan said that for a year Venezuela had shown what she called nearly total lack of support for counter-terrorism efforts. As a result Venezuela was being listed as "a country of concern". The ban means Washington will not permit any military sales to Venezuela, the spokeswoman said. The re-sale of arms manufactured in other countries would also be prohibited. Washington has already put pressure on Spain and Brazil to halt their plans to supply military equipment - including aircraft - to Venezuela which contains some US technology. However, the US has been unable to block a purchase by Venezuela of some 100,000 rifles from Russia. The guns have not yet been delivered. 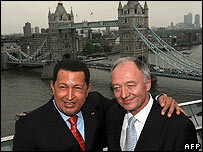 In London, Mr Chavez brushed aside the US move. "It's the empire and it has a great capacity to do harm to the countries of the world," he told the Associated Press news agency. He said his government would not respond with punitive measures. US officials argue that the rule of President Chavez is eroding democracy and human rights in Venezuela and that he is working to undermine American influence in the region. What do you think about the ban on arms sales? What impact will this have on Venezuela? Send us your views using the link below.